We here at Magnificent Moments Weddings get to work with some pretty amazing couples, but you want to know a secret, we love their families too! A wedding is the bringing together of two families so it’s only natural that we not only work with our couples directly but also their sweet families as well. So this month we decided to shine our client spotlight on an amazing Mother of the Bride! We reached out to Elaine Auslander, who’s daughter Anna married her husband Greg at Foundations For the Carolina’s early this spring. We wanted to ask her all about her experience, from the high to the lows, and here’s what she shared. What was your greatest memory of your daughter’s wedding day? My greatest memory is a tough one. So may things pop into my head. The vows were so heartfelt, and their first dance looked rehearsed, though it wasn’t. I loved Anna and Ed’s dance—both were in tears. Did the day bring back any memories of your wedding day? Memories from our wedding day. This one is simple. We had a white cake with fresh flowers, like they did. Is there anything you would change about your daughter’s or your own wedding day? I wouldn’t change a thing about their wedding day. It was absolutely perfect. We chose MMW because Anna and Greg liked Amanda. I’m happy they did, because I feel like I made a real friend with Amanda myself! She is so professional and warm, unbelievably organized, thoughtful and intuitive. The list goes on and on. Would you recommend hiring a wedding coordinator/planner to others? I would recommend a planner for sure. I think it’s important to interview them first. You need to feel comfortable with whomever you choose. Amanda helped to steer us toward the right vendors. Having the team we had was amazing. Thank you, Elaine, for all your kind words! 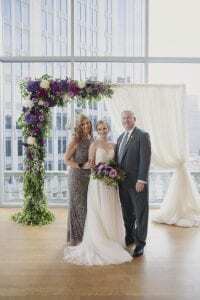 Anna and Greg were truly an inspiring couple and you were a dream Mother of the Bride to work with!